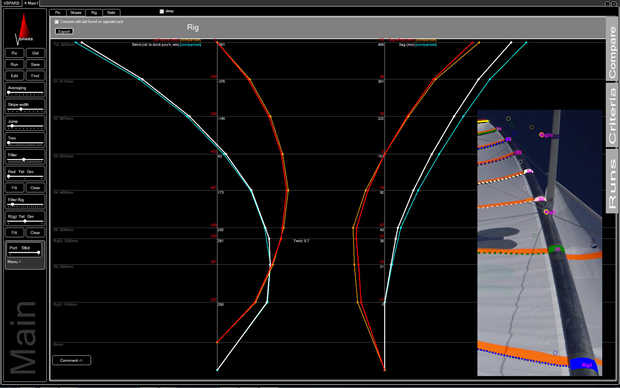 An enhanced rig tuning tool is also available within the VSPARS suite. Using the VSPARS Mainsail cameras the VSPARS software tracks the mast position in Real-Time and compares the current position to a known dock setting. This results in a very high accuracy (<5mm resolution at 30m) plot of mast bend, sag and twist over a range of heights. This means unequal stretch of rigging elements and dynamic behaviour can be accounted for whilst tuning your rig. See how VSPARS captures the sail shape or combines the sail vision and rig vision to give the shape and position of everything above deck.